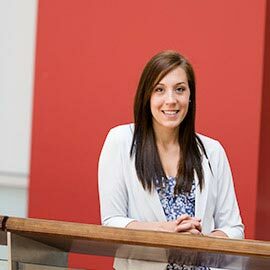 The Laurier Centre for Economic Research and Policy Analysis (LCERPA) has awarded Kourtney Koebel the 2014-15 LCERPA Undergraduate Research Award for her work examining universal child benefits and the labour supply of single mothers in Canada. Koebel, a fourth year Economics and Political Science student, investigated the impact of the Universal Child Care Benefit (UCCB) on the participation rate of single mothers in Canada’s labour force. While married mothers were found to work less when receiving this benefit, divorced and separated mothers were found to be working by 2.4 percentage points more than their married counterparts after the introduction of the UCCB in July, 2006. Koebel’s next steps are to determine an explanation for this result. The runners up included Majid Hashimov, for his research on inflation targeting versus exchange-rate targeting, and Jordan Nanowski for his research on business formalization in Vietnam. Eight nominees presented their research at the WLU Economics Undergraduate Research Symposium April 29. This is the first year LCERPA has run the symposium, which was established to recognize demonstrated excellence in research ability among Laurier's undergraduate students. LCERPA offers Laurier's undergraduate students in economics excellent opportunities to develop and promote their research skills. For more information about LCERPA visit www.lcerpa.org.